Magical Land of the Jaquins! Synopsis: Join Crown Princess Elena as she soars through a hidden gateway into Vallestrella, the mysterious, dazzling domain of the jaquins. On the way there, she accidentally releases a mythical forest sprite that could endanger Avalor! Now Elena must find the jaquins’ magical, legendary Sunbird Oracle to save the kingdom! 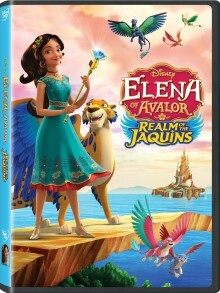 To enter for a chance to win a DVD copy of ELENA OF AVALOR: REALM OF THE JAQUINS, send an email to contest@LatinoScoop.com. When entering, please submit your full name, email address and phone number. LatinoScoop will select a few winners. Winners will be notified via email.